Fundamental LA has appeared on this blog before, and so long as they keep making sandwiches they’re likely to continue appearing. 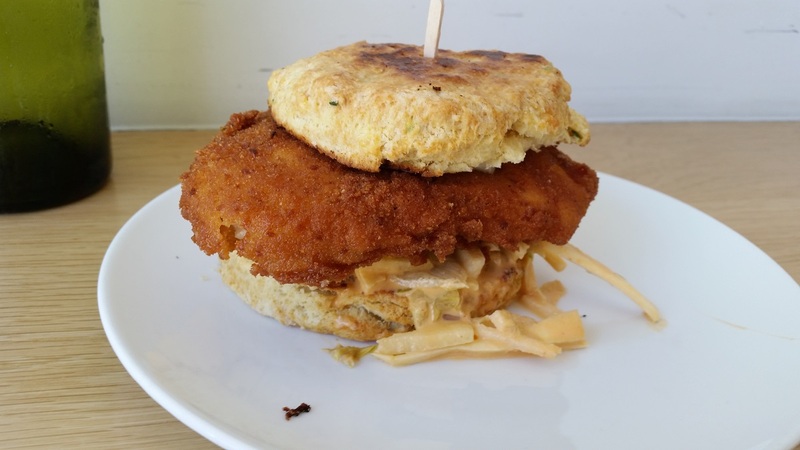 Here they’ve gone the simple route, combining fried chicken with jimica and parsnip slaw on a house-made biscuit. I’ve had fried chicken sandwiches that are probably better, notably the Southern Fry at Plan Check, but I don’t know that I’ve seen one that does more with less. This is your standard chicken biscuit, raised well up with a spicy, crisp slaw that’s a good bit tastier than a few bread & butter pickles. There’s nothing wrong with the old standard, but Fundamental LA excels in demonstrating what’s possible beyond that. This entry was posted in Sandwich Reviews and tagged Fundamental LA, Los Angeles, Reviews by Pete, Westwood by Pete. Bookmark the permalink.